Fun Facts about Ladybugs to Amaze Your Friends! Why Do Ladybugs Have Spots? WIN LearnAboutNature.com Great Site Award! All family-safe sites can apply. Insects > Ladybugs > Fun Facts about Ladybugs to Amaze Your Friends! they save gardens by eating pest insects. The scientific name for a ladybug is a coccinellidae, which means �little red sphere�, or coleoptera, which means �sheath-winged�, but most people just call them ladybugs, lady beetles, or ladybird beetles. There are different versions of how these beetles came to be known as ladybugs, but one of the most popular versions is that during the Middle Ages in Europe, the crops were being taken over by insects and dying. People were beginning to starve so the farmers decided to pray to the Virgin Mary to help them with their insect problem. The farmers were a little bit upset when even more insects showed up, little red beetles with black spots on them, because they thought that these new insects were going to eat the crops, too. But the beetles that came actually ate the bugs that were eating the crops, and so the beetles became known as the �beetles of Our Lady�, eventually shortened to simply ladybug. In another case in the 1800�s, and this case is a fact and not a legend, the orange and lemon farmers in California began having problems with insects destroying whole groves of orange and lemon trees. The insects were Australian scale insects, so the farmers imported Australian ladybugs and released them into the orchards. Within two years the orchards were free of the scale bugs and the entire orange and lemon industry was saved by the ladybugs. Since the 1800�s orange and lemon incident, ladybug farmers have cropped up. Raising ladybugs became a big business and farmers around the country began buying and using ladybugs to control pests on their farms. Today people buy ladybugs in smaller amounts to release into their gardens to have healthy plants without having to use pesticides. You can get some from your local nursery or garden center to use in your garden. You can also order ladybugs online. 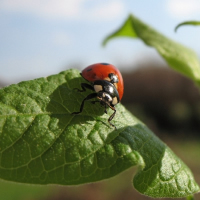 The best ladybug species to use in the garden or on a farm are called hippodamia convergens. You can recognize these ladybugs by the two white dashes that are on the back of its body above the hard wing casings. These ladybugs can eat a ton of aphids in no time, and they will stick around to protect your garden for a long time, too. However, only the ones that don�t fly off as soon as you release them will make your garden a home, so be sure to get more than you think you need to accommodate for the runaway ladybugs. You can start your own ladybug rearing farm to make sure that you always have enough ladybugs for your garden. There are ladybug farming kits that you can buy at some lawn and garden stores who sell ladybugs during the spring and summer seasons, or you can order a ladybug farm online any time of the year. Our articles are free for you to copy and distribute. Please give //www.ladybug-life-cycle.com credit for the article. Why the Ads? � How Can I Help? � © Learn About Nature. All Rights Reserved.